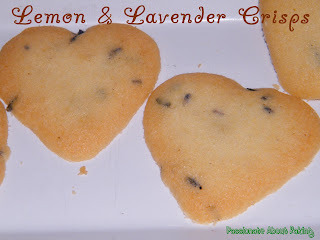 Having tried the Lavender Madeleines, I tried the Lemon and Lavender Cookies from HHB. 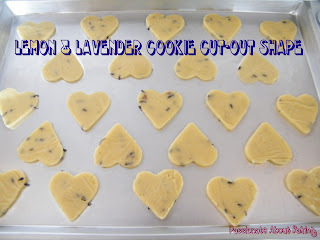 The picture of her lavender cookies was very tempting and therefore, I decided to make it. 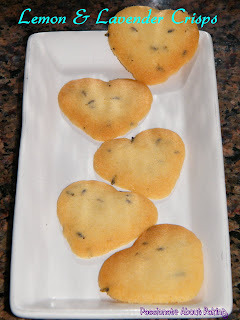 Updated Post: Finished baking my cookies! Armed with a carrier of empty containers, an apron and camera, I set out early morning on Saturday, looking forward to my mee siam workshop. I met up with my dear friend and her family for breakfast at Marine Parade. After breakfast, I set off to my mee siam workshop. As the instructor was staying at the top most floor, the scenery, facing the sea was really marvelous. 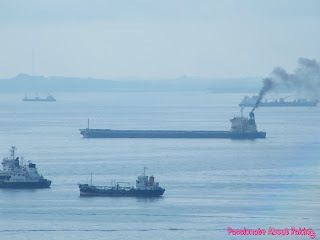 With my Fujifilm Finepix, I was able to zoom and captured them far far away! 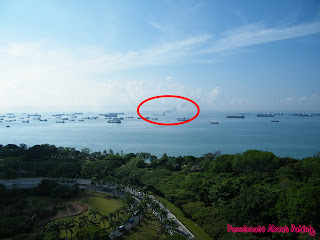 Zoom in 15x using my Fujifilm, I found the vessel with the steam up close! 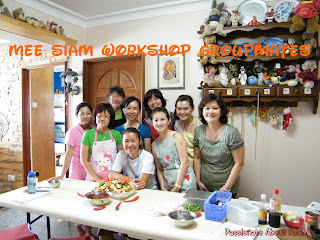 Back to my mee siam workshop, there were 16 of us, quite packed I should think. This is roughly what I had captured. 1. Ingredients for frying the dry mee siam. 2. 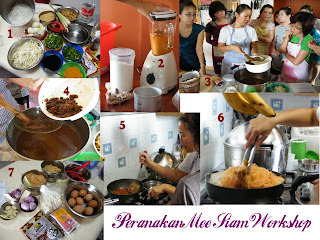 Blending the ingredients for rempeh for the mee siam gravy. 3. Mrs Fong showing us that after one round of soaking assam in water, there are still a lot of "fresh" stuck to the seeds. 4. Draining out the assam water. 5. Mrs Fong showing the correct way to hold the ladle when cooking the rempeh. 6. The real way of cooking mee hoon is using tongs. This is to maintain the "longness" of the mee boon. 7. Initial basic ingredients placed on the table when we arrived. These were the final food presentation at the end of 3 hours. 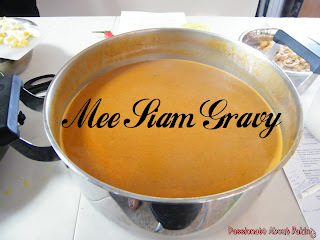 Mee Siam gravy that was simmer for 1½ hours. Peranakan Dry Mee Siam decorated by my groupmates. 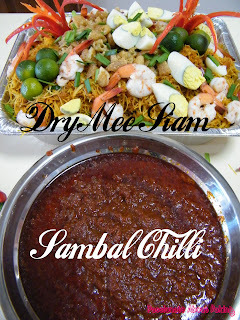 Sambal Chilli for Mee Siam cooked mostly by me. Finally, a group photo with my wonderful groupmates with team efforts! My younger sister returned from Tasmania Australia last week. She brought some lavender from Bridestowe for us. When I was in Tasmania some 10 years ago, I didn't know about lavenders, nor was it so popular else where in Australia too! 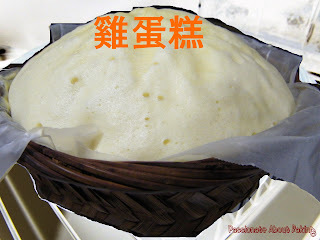 Now, it's so popular and common and even used for baking! Well, I actually got some from PH some weeks ago, so I decided to use them first before using those from Tasmania. The smell of lavender was really powering. It was exactly like those smell from bath foam, or potpourri. 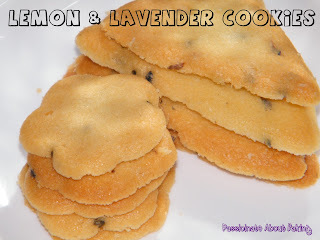 I didn't have doubt about its smell and its taste until I saw the post from HHB about eating lavenders. I quote "Since this is the first time I have tasted lavender, I have yet to acquire the taste for it. I don't dislike it, neither have I fallen in love with it." I think I had to agree with her about this though. The smell of the madeleines from the oven was really nice, but eating and biting into the lavender, does have some bitter taste. Not sure if I had put a little too much? Otherwise, I really like the smell...though not yet the taste! 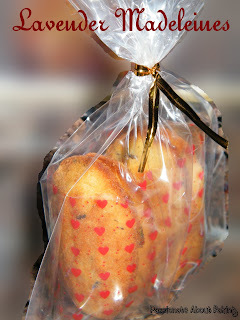 Fortunately, the buttery taste of the madeleines made up for it. 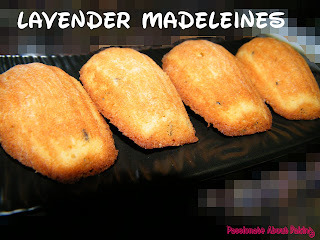 Recipe for Lavender Madeleines extracted from Tartelette. Makes approx. 30pcs based on the mould from Daiso. 2. Sift the flour, baking powder and salt together. 3. Beat the eggs, sugar and lemon zest until pale and thick, about 3 minutes. 4. Add the honey and vanilla and beat for one minute more. 5. Using a rubber spatula, fold the flour mixture into the eggs batter carefully. Fold in the butter. 6. Preheat the oven to 190C (170C for fan oven). 7. Butter and flour your madeleines molds and divide the batter evenly. 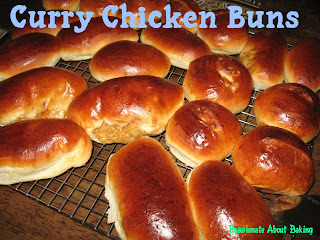 Bake for between 10-12 minutes until they are golden brown. I'm not one who is heartless, in fact, I have too much sentimental value that my house is almost like a storeroom. I can't help but to look for a new love. The current one just lets me down. Whenever I needed it, it just can't work. It drained out too much energy too fast. Determined and decided, I have decided to look for a new love. 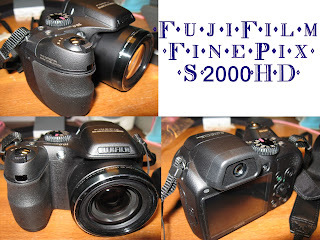 Therefore, the final decision was Fujifilm FinePix S2000HD. 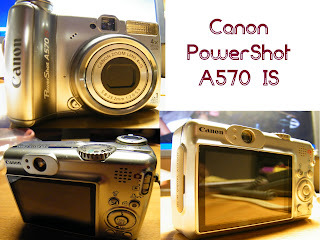 Actually, I still love my old flame - Canon Powershot A570IS, very much. It's light and easy to use. Unfortunately, I think I must've bought a "lemon" piece, it drained my batteries so much so that I had to replace batteries weekly even though I only used it for a couple of shots. Isn't that disappointing? This is the basic & main comparision. I had been rather lapse in posting lately. I had been lazy, busy and dizzy all week! When I'm in front of the PC, I felt dizzy, then lazy set in. However, I cannot be lazy anymore, otherwise, I'll have lots of backlog posts!! Goodness me! I had been busy whole week, preparing for Saturday. I made Vanilla Ice-Cream and Cheesecake in the mid-week, prior to Saturday. As both of these needed to be refrigerated way before the actual day of consumption, I had to prepare them in advance. 1. Vanilla Ice-Cream. 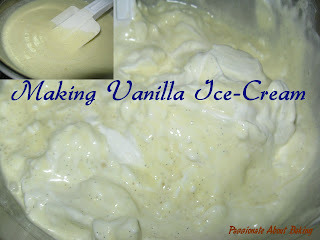 I went through all the ice cream recipe, wanting to find the easiest to make. 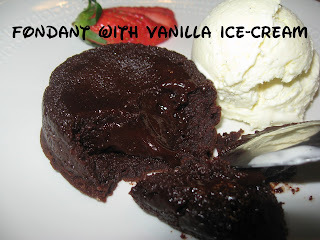 As it was to be used as an accompanied to my sister's Chocolate Fondant, I want it to be easy and creamy. I finally use the recipe from Recipetips.com. I modified the recipe a little to suit my taste. Instead of 6 egg yolks, I used 10 egg yolks as my eggs were pretty small. 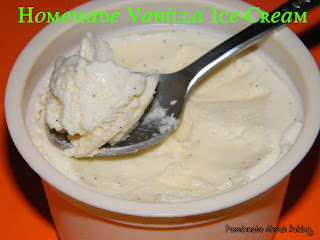 I replaced vanilla extract with a vanilla pod seeds and used 2 cups of whipping cream instead. The end result?? Creamy, real & taste expensive!! 2. 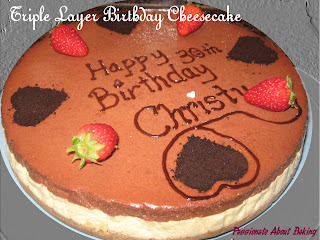 Triple Layer Birthday Cheesecake. My youngest sister requested for a cheesecake. I asked if she can accept anything exotic, she said she can't. As I've baked cheesecake for her and my BIL before, I couldn't think of what other flavour I could try. Last year was the Chocolate Torte. How time has fly! 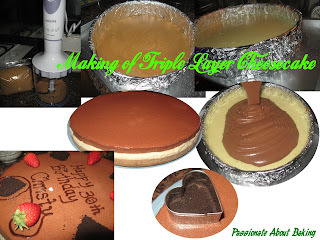 After going through my cheesecake recipes, I finally settled on the recipe from "Delicious Cakes" called Triple Layer Birthday Cheesecake. This recipe needed to steam-bake the cheese layer by layer, each layer for 30 minutes. 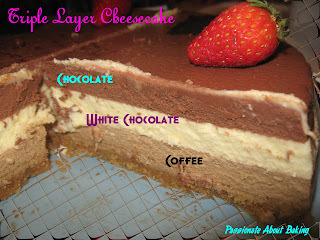 The three layers are Coffee, White Chocolate and Chocolate. I was thinking of topping it with a layer of crusted oreos after baking. However, after baking, the top was so smooth...so beautiful! There was no cracks to be found anywhere! This was my BEST cheesecake I ever baked! So I decided to frost as little as possible, to keep the smooth top visible. So this was my final decoration! Saturday bakes include the following. 3. 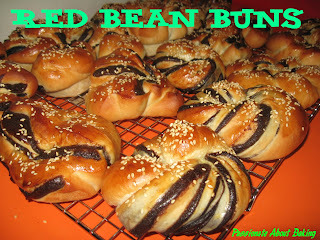 Red Bean Buns. I bought the red bean paste from PH lately as I found their red bean paste to be very nice, and I remembered my dad likes it. So I made a whole bunch of them to be given to my family members. I made different designs and put them into the muffin trays, an idea I got from Honey Bee Sweets. 4. 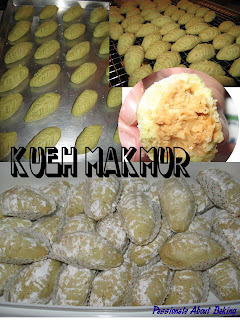 Kueh Makmur. This was in my "To Bake" list. 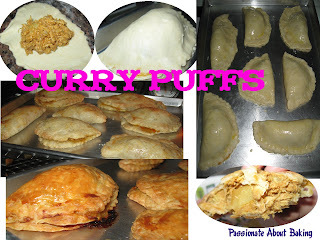 After the unsuccessful attempt the last time, I had to try again using different recipe. I used Honey Bee Sweets' recipe this time, though quite a lot of work, I was quite determined to bake this. However, I had added the egg white while the flour were not thoroughly cooled, resulting in my dough being too wet to roll. I ended having to put them in the fridge, then adding a lot more plain flour to it. The baking caused the dough to crack. 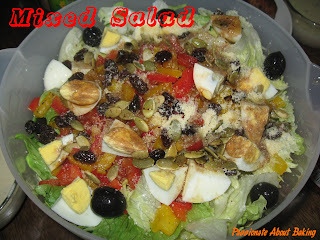 Fortunately, the overall taste was much better than the previous attempt. At least, it was still melt-in-the-mouth texture! Quite happy with the outcome, though not happy with the process! Last Tuesday, we were supposed to bring the children to the zoo. Unfortunately, a decision was made the night before not to go since the weather forecast indicated that showers with thunders are expected on Tuesday. So we decided not to the zoo, then my hubby and I went back to office. 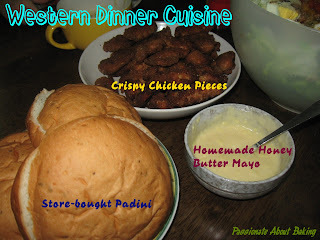 Initially I intended to prepare western food for dinner. However, since I went back to work, I had to teach my domestic helper how to prepare western cuisine, in particular, cream of mushrooms and crispy chicken pieces. Well, having promised her that I'll bake her a cake, though didn't elaborate what, I had to keep my promise. Initially, I decided to make all full chocolate for her (quite different from her request leh?!) Then I decided to at least, try tracing a cinderella? Or at least, did what I had done for Aloysius previously. Somehow, the chocolates just refused to be removed from the plastic (forgot to take picture of this). In the end, I had to use my free hand to draw the Cinderella. 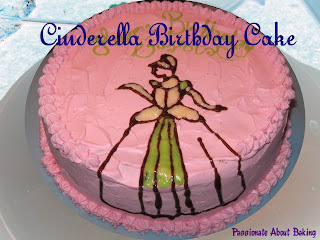 As I didn't position poor cinderella properly, her dress was not enough to cover the cake. Then I thought to myself, since it's already damage done, then I'll have to do damage control. Might as well extend her dress down to the side. Suddenly, I was quite proud of myself for coming up with such a brillian design! Hahaha... not creative I supposed, not original too! But at least I was sober and was able to think slightly faster than normal! Hahaha... Funny thing was, I frost the cake with pink whipping cream instead of the usual chocolate ganache on a chocolate based sponge cake. Another brilliant idea I did was to place a tart crust in the centre of the cake, so as to give the "crispy" taste when eaten. True enough, it did! There were four layers of cake, the filing was-sponge, strawberry jam, sponge, chocolate ganache, tart crust, chocolate ganache, sponge, strawberry jam, sponge & whipping cream. Quite cool right? I'm pretty happy with a couple of firsts on this cake- tart crust and drawing till the side. 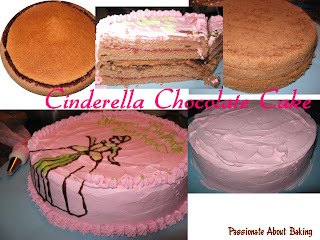 I'm so glad my niece, Crystal, was very happy with the design and the taste of the cake. 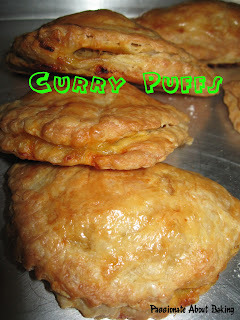 I had purposely cooked more curry chicken on Wednesday so that I can make curry puffs and buns during the weekends. Thankfully, I was able to bake what I had hoped for. 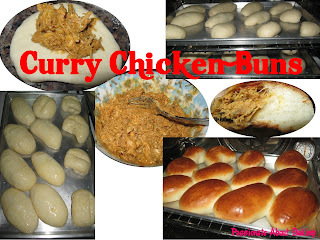 One filling-curry chicken, two tastes-buns & puffs. 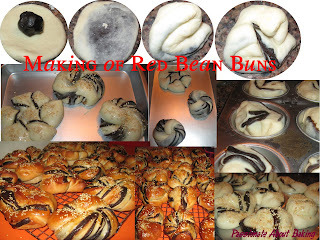 I was very happy with the outcome for the buns, but not really the puffs. I was trying to squeeze too much fillings into the puff pastry that they can't "seal" properly. :p And the shape and size became so weird that my sisters rejected it. Fortunately, my kids still love them! I was yearning to use my vanilla bean seeds since the day I got my hands on it. However, I just didn't find the right recipe to use it. 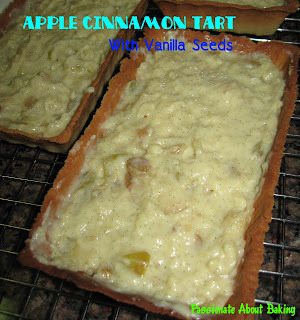 As I was thinking of making Apple Cinnamon Tarts, I decided to use the vanilla seeds for my pastry cream. 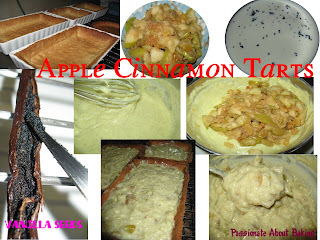 I cooked my green apples with raisins, brown sugars and ground cinnamons. Then mixed them into my pastry cream. The feeling of scrapping the vanilla seeds out of the beans was really SHIOK! The taste of the pastry cream with its really vanilla seeds is really empowering! I simply love it! No artificial extracts or essence were needed! I wanted to do a special birthday cake for my boss, who has been a very fantastic boss to me for the past two years. 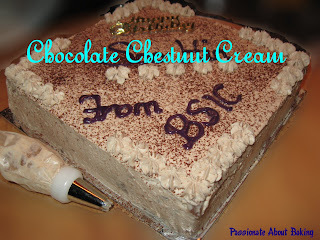 How better to show my appreciation than through the cake I created for him. I wanted to do something special, which I thought and hope he might appreciate. So I decided to make a Chocolate Chestnut Cream Cake for him. Last year, I baked a Passionfruit Cheesecake for him and shared the cost among my colleagues. 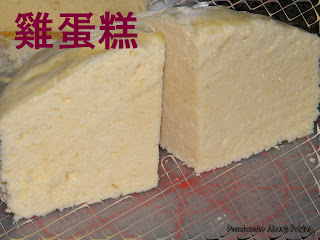 Since I bought the Chestnut Puree from Sun Lik, I've not tried it yet. Good opportunity to take it out and use it now. I used emulsifier cake base, and added some whipping cream to the chestnut puree for my frosting. I still need to improve lots for my frosting. However, it seemed it wasn't quite well received by my colleagues as the taste was rather rare & unique. 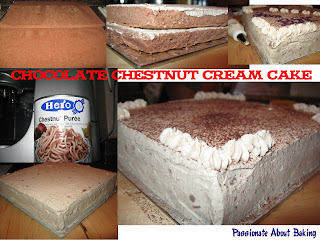 But it's okay, certain taste need time to acquire, and I think chestnut is one of them. Some weeks back, I've already hinted to my hubby that we should be celebrating our wedding anniversary soon, and that we should go for a good meal. He got the hint. I suggested Jaan, a french fine dining restaurant in Equinox Complex. He was reluctant though, after hearing from my younger sister who also lately celebrated her wedding anniversary there, that it's not so filling after ordering their set dinner. The reason why I suggested there was because of the Feed At Raffles card, which entitles us to a 50% discount on foods. So better to eat quality than quantity. 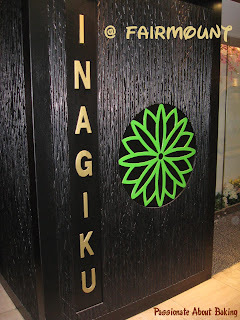 After much discussion, and having checked with my elder sister on where is good since my hubby said Jaan might not be filling for him, she suggested Inagiku's teppanyaki. Heeding her advice, he made reservations for Thursday and informed the restaurant that we are celebrating our wedding anniversary. So on Thursday evening, my hubby and I headed to Raffles City separately and met at Fairmount lobby before heading to Inagiku. 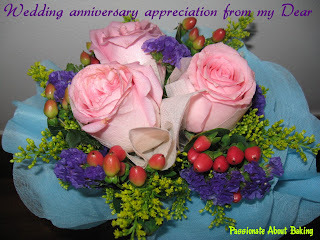 He had bought me a small bouquet of flowers despite having to rush from his course to pick up the car at home. That was really sweet of him. 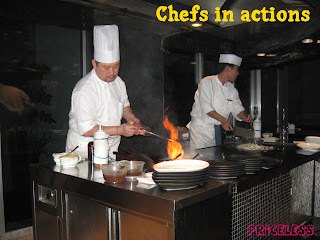 As we had wanted to try their teppanyaki, my hubby had reserved to be seated at the teppanyaki table, so as to see the chef in action. These were what we had. 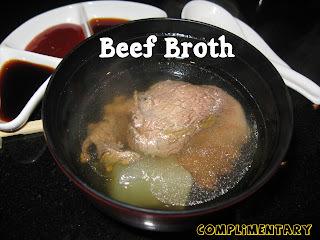 Complimentary Beef broth from the chef. 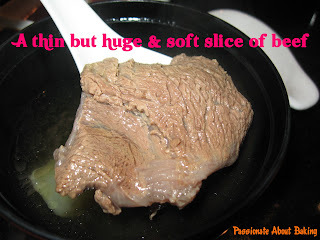 He said this was boiled using radish, beef and rice wine. Very good indeed. 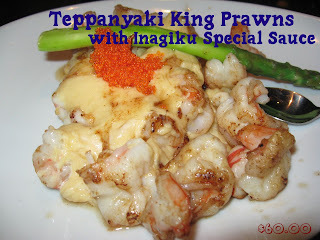 Teppanyaki King Prawns with Inagiku Original Golden Sauce. 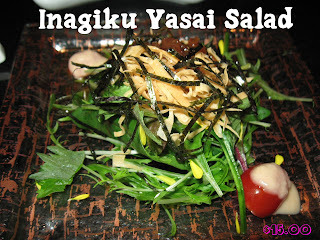 This had many good reviews from most of the food reviews I found in the websites. 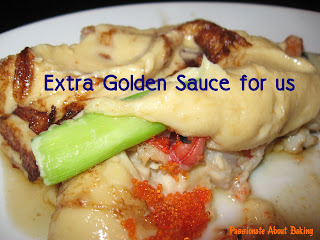 I told the chef I've heard so much about the golden sauce that I must really try and have more. Aftering hearing this, he cooked more sauce and placed it on my plate. The sauce was really really special. Cost: $65.00. However, having eaten quite a lot of the sauce (more than the prawns now), I was really getting very very full. I had to ask him to slow down first. I was pretty glad that we went in the weekday where the place wasn't packed. 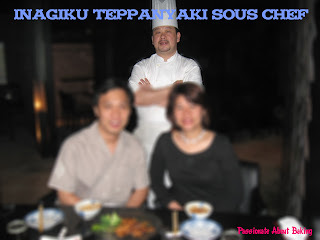 The chef, Sous Chef Eric Yong, was able to drop by our area and chit-chat with us often. Not only that, he also took picture with us. He is very friendly and warm. He even shared some of his recipes with me! Hahaha... Too friendly? As the evening went, there were slightly more crowd. So we told him to proceed with our next dish. 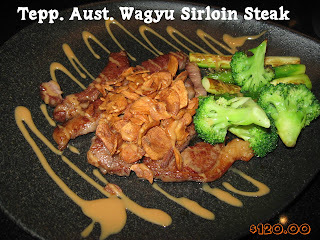 Australian Teppanyaki Wagyu Sirloin Beef Steak (150g). We ordered medium well initially. However, he suggested we should take medium instead. So we heed his suggestion and took medium. No regrets. Medium was just PERFECT! The outside was crispy, the inside was tender & juicy. It wasn't chewy, and not bloody. The sesame sauce that came with it was very good too. I would have thought it was peanut sauce had he not taught me how to do it! Hahaha... Cost: $120.00. 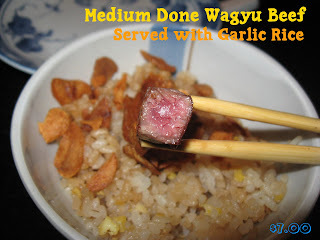 Followed closely after Wagyu Beef was the Garlic Rice. Luckily we cancelled the Fried Chicken Rice during our "prawns" break. Otherwise, we really couldn't finish the food! The garlic rice was pretty different from those which I took in Japan. I asked him why and he said we won't be able to take the rawness of the japanese garlic. Well, I'll leave it at that then. Cost: $7.00. 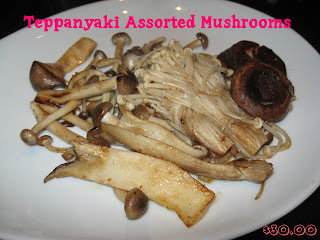 Our Teppanyaki Assorted Mushrooms also came immediately after the rice. It was cooked with butter. 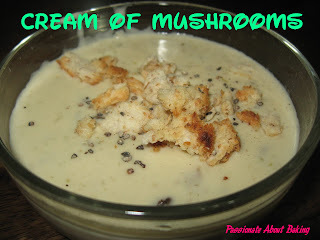 The buttery taste with the mushrooms do blend. Very fragrant. He used unsalted butter as he told me. We didn't finish this as we were really to the brink of our throat! We didn't realised we had ordered too much! Cost: $30.00. Actually, it was really considerate of the service staff to split the salad and the garlic rice into two bowls for us. All the food that we ordered, is only one share. But it came in two bowls. On and off, when we were resting, we saw how they prepared the prawns in their special sauce. First, he fried the prawns. Then he gathered the prawns together and poured the golden sauce on top of the prawns. He lit a match-stick with fire, poured some rice wine through the match-stick and burned the prawns and let it cooked for a while. He scooped up the prawns and over-turned it into the serving plate, which meant the golden sauce is now below. Topped it with fish roes and apparagus and served. Finally, after paying the bill, we were given complimentary Green Tea Chocolate each. 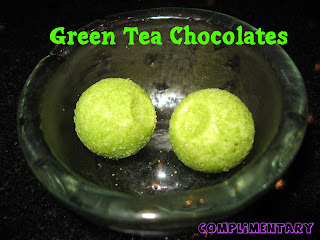 A thin white chocolate shell covered with green tea powder and sugar, with soft green tea fillings. This is just perfect as it is not sweet, but has very good green tea taste. 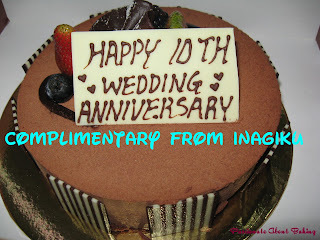 Happy 10th Wedding Anniversary to my dear hubby!